محمد نژاد, وحید, اصغری, صیاد. (1397). ارزیابی خطر زمین‌لغزش با استفاده از روش‌های آماری در حوضه آبریز باراندوز چای. پژوهشهای ژئومورفولوژی کمّی, 4(4), 181-191. وحید محمد نژاد; صیاد اصغری. "ارزیابی خطر زمین‌لغزش با استفاده از روش‌های آماری در حوضه آبریز باراندوز چای". پژوهشهای ژئومورفولوژی کمّی, 4, 4, 1397, 181-191. محمد نژاد, وحید, اصغری, صیاد. (1397). 'ارزیابی خطر زمین‌لغزش با استفاده از روش‌های آماری در حوضه آبریز باراندوز چای', پژوهشهای ژئومورفولوژی کمّی, 4(4), pp. 181-191. محمد نژاد, وحید, اصغری, صیاد. ارزیابی خطر زمین‌لغزش با استفاده از روش‌های آماری در حوضه آبریز باراندوز چای. پژوهشهای ژئومورفولوژی کمّی, 1397; 4(4): 181-191. در مقاله حاضر پتانسیل وقوع زمین‌لغزش و خطر آن در حوضه آبریز باراندوز چای (آذربایجان غربی) موردبررسی قرارگرفته است. بدین منظور از روش آماری شاخص خطر HIM استفاده شد. داده­های مورداستفاده در این مقاله شامل داده­های توپوگرافی، کاربری اراضی، نقشه­های زمین­شناسی و همچنین نقشه زمین­لغزش­های اتفاق افتاده در سطح حوضه است. نقشه پایه در این زمینه، نقشه­های توپوگرافی 25000 حوضه است. شش عامل اصلی و مؤثر بر وقوع زمین­لغزش در حوضه انتخاب و نقشه­های آن به‌منظور وزن دهی، تهیه گردید. این عوامل عبارت‌اند از: شیب و جهت شیب، سنگ‌شناسی، خاکشناسی، کاربری اراضی و ژئومورفولوژی. درنهایت با استفاده از نقشه­های استانداردشده شش‌گانه، نقشه پتانسیل وقوع زمین­لغزش در حوضه آبریز باراندوز چای تهیه و ترسیم شد. پتانسیل خطر زمین­لغزش در حوضه موردنظر به پنج طبقه کم، متوسط، متوسط تا زیاد، زیاد و خیلی زیاد تقسیم گردید. نتایج نشان می­دهد که شیب­های بیشتر از 30 درجه و جهت شیب جنوب و جنوب شرقی و مناطق کوهستانی بیشترین پتانسیل زمین­لغزش در منطقه موردمطالعه را دارند. مدل مورداستفاده در این مقاله با استفاده از محاسبه مساحت زیر نمودارهای Cross-validation، مورد اعتبار سنجی قرار گرفت. میزان اعتبار آن در حدود 79/80 برآورد شد که بیانگر دقت خوب مدل است. همچنین فرایند تحلیل اثر از طریق حذف تک‌به‌تک عوامل مؤثر شش‌گانه از مدل و بررسی خروجی آن‌ها، صورت گرفت. این تحلیل نشان داد که شیب عامل اصلی در وقوع زمین­لغزش در حوضه است. نتیجه دیگر اینکه که می­توان عامل اصلی در وقوع زمین­لغزش را با دقت بالایی مشخص کرد. 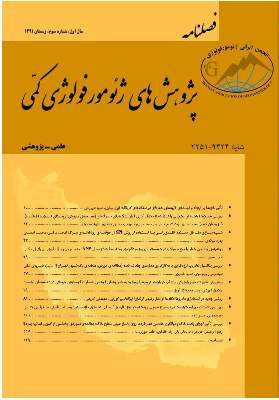 درنهایت نتایج نشان می­دهد که علی­رغم وجود محدودیت­های عملی و مفهومی و داده­های دقیق، تهیه نقشه خطر زمین­لغزش و همچنین ارزیابی آن می­تواند در برنامه‌ریزی آمایش سرزمین و کاهش خطرات طبیعی و همچنین هزینه­ها مؤثر واقع شود. Iran with mostly mountainous topography, tectonics activities and earthquakes, diverse geological and climatic conditions have natural and suitable conditions for a wide range of landslides. In Iran, landslides Imposes 500 billion into the financial damage annually. In a general definition landslides are movement of rock, debris or soil under the influence of gravity. Landslide susceptibility maps, are an important tool for regional planning. The purpose of Landslide susceptibility maps is separation surface homogeneous areas, according to the likelihood of instability due to mass movements in specific situations. Landslide zonation map process is based on the understanding of natural features and quantitative modeling based on data for the study area. These estimates could be considered as the basis for next steps and plan for the future development of the regional and local scale. Various effective factors on landslide are, altitude and aspect and slope, heavy rainfall and water penetration through cracks and gaps, large fault activity, drainage network, land use changes, variety and texture of rock and soil type that is effective in strength and permeability, region geology and human activities. The present study is an attempt towards development of a landslide model by using multi-criteria decision analysis in GIS and remote sensing techniques. Identify the most important factors affecting landslide occurrence within the catchment area and finally provide landslide hazard zoning map for study area. In the first step, Positions of 38 landslides were recorded in the Barandoz chai basin, was marked on the map. Identify factors that affect landslides occurrences and map of these factors were provided. Factors such as slope, aspect, rainfall, lithology, vegetation density, Distance or proximity to faults and rivers, type and depth of soil are affective in landslides occurrences. Therefore, 1: 25000 scale topographic maps was chosen as the base map. Other information (secondary data) was derived from the different input data (e.g., slope and aspect from topographic maps). 1: 100,000 Geological map of study area, was used to identify rock units and fault density. Land use and vegetation maps developed using Landsat 8 (2014) and SPOT satellite images (2009) and the supervised classification method. This map were compared with previous land use and vegetation maps. The collectively called causal factors (primary and secondary data) were used as inputs into the statistic model. This was separately calculated to give the respective weight and was finally analyzed for the landslide susceptibility assessment in Barandoz chai basin. Finally, maps of landslide potential in the Barandvz chai basin have provided using hazard index method. In order to assess the vulnerability caused by the landslide, landslide potential map (risk factor), provided using the statistical method of hazard index. Noted that all the processes and maps providing, were performed in ArcGIS software. Slope map of basin produced using 1:25000 topographic maps and have been weighted using the hazard index formula. Other factors as well as have been weighted using the hazard index formula. It should be noted that the base of this method is landslide layer overlaying with each of the factors affecting landslides layers. Landslide potential map provided. This map separate to five classes including low potential hazard, moderate potential, moderate to high potential, high potential and very high potential. By calculating the respective weight for six different causal factors, it was recognized the area with S and SE aspect, mountain and semi mountain geomorphology, Scattered ranch land-use, laterite loam and clay, more than 30 degree for were among the most susceptible areas for landslide occurrence. The results show areas of high and very high potential have been scattered in West and Central East of basin. In order to evaluate the validity of the method Cross Validation was used and was estimated 80.79 percent for study area. This amount represents the model's accuracy. By calculating the respective weight for six different causal factors, it was recognized the area with S and SE aspect, mountain and semi mountain geomorphology, Scattered ranch land-use, laterite loam and clay, more than 30 degree for were among the most susceptible areas for landslide occurrence. The results showed that 38 percent of total area of basin, has high and very high potential for landslide occurrence. Primarily due to the lack of reliable and high-resolution rainfall fields, few statistical models have included rainfall variables as explanatory variables. The final landslide susceptibility map, with the combination of all the weights, yielded a satisfactory prediction of the landslide with a success rate of 80.79%. Despite the operational and conceptual limitations, landslide hazard assessment should be a suitable, cost-effective aid to land-use planning and hazard reduction. Effect analysis showed that slope played the most important role in the landslide analysis since slope bore the greatest weight. Therefore when all factor weights were added except for the weight of the slope, the resultant weight greatly diminished which in turn reduced the percentages of landslide.